Welcome to Game Dev Network / CFN's Tasty Blueberry Jam! Theme -- "Are you trying to get yourself killed?" Yes, yes you are. Game Dev Network is a community of game programmers, artists, sound engineers, any role remotely related to games really. Whether you're looking for an extra team mate for a project, need help squashing that pesky bug or just want some feedback on your latest pixel art masterpiece, we're here! CFN or Computerfiguur's network is a multi-person indie game review network. We work with very small indie developers to help provide their games with critique and exposure. We work in reviews primarily, but also do previews on occasion and will provide pointers and critique from a game journalists perspective. CFN consists of the Computerfiguur.com website, the CFN youtube channel, where we post daily content of all sorts of indie game material, and "The Indie Spot" podcast, where ChocolatierGames and Warsong take a look at promising indie games every other week. We like to shed light on small-scale projects to help indie devs get exposure while building up our own scale and exposure. We have a passion for what we do and work our best to ensure maximum quality in everything we create. As a huge game jam advocate and having ran multiple jams in the past, I am never not asked "why?". Not only does participating in a game jam give you the chance to flex your creativity and build on your portfolio, you get the opportunity to talk to other jammers, get feedback and make connections. You'll have from Saturday June 3rd 00:00 GMT until Sunday June 11th 23:59 to create and submit your game. You hold all rights to anything created during the jam. You may upload the source of your game, however this is optional and participants are under no obligation to do so. No NSFW content - Q: Can we still have blood splats? A: Hell yeah but make sure they're clothed! No stolen content - Feel free to use snippets here and there from past projects, but please keep entries original and without copyright violations. Even royalty free D:? - Within reason; You're welcome to use any public domain assets, though if you stumble upon an RPG framework and reskin it, that's a bit far. No engine restrictions, whatever you feel comfortable with! We are thrilled to announce that the winning team will receive a 3 hour PR Planning and Consulting session with the fantastic GoPublixPR. * She will help you coordinate your press kit, explain the important key collateral and information you need to have. * A full review of your game positioning, along with advisory on how to pitch the press. Each member of the winning team will receive a copy of Not A Company's upcoming indie title, Hoverloop! 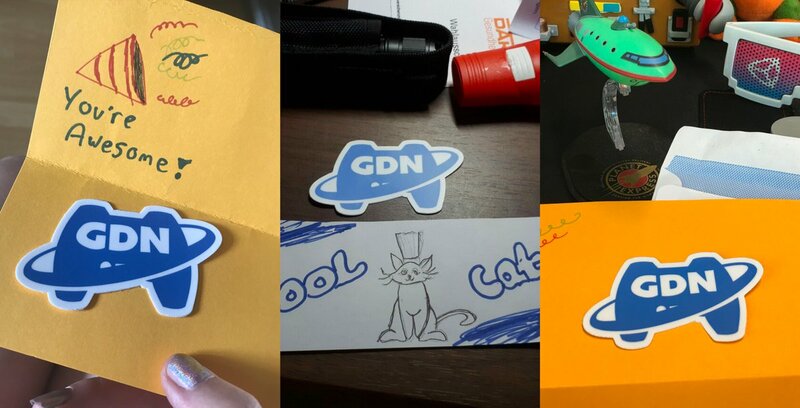 In addition, members of the winning team will each receive a high-quality die-cut GameDevNetwork sticker, we don't do that cheap stuff here! Postage is free! Winners will also receive a fancy role on the server to celebrate jam prowess. The biggest reward for participating in jams is the fact that you have created something, in recognition of all of you wonderful people, we'll be giving away three of our highly prized stickers to random participants! If you've made it this far you've already met any requirements to take part. Now get out there and make something awesome you crazy dev you! A hero travels to the end of the earth to find the one thing that can challenge them. Death. Crawl between clones to stay alive in the brutal trap-filled dungeon to collect gems! You. Will. Die. A lot. Like the TV Show Wipeout, but with explosives, local co-op or race for time.